Platform party: Norman Atkinson OBE, Chairman Angus Museums & Heritage Forum, Margaret Copland (President MLHS), Cllr. Sheila Hands, Cllr. Beth Whiteside, Rhonda McFarlane Economic Development & Funding Officer, Angus Council, Sylvia Breen , Communities officer Angus Council, Marianna Buultjens (MLHS). Present: 21 Monifieth residents and supporters. Apologies: Jean Lee, Chairperson MCRG), Madge Buntin (MCRG), Al Buntin (MCRG), Cllr. Fothringham, Clive Goldstraw , Voluntary Action Angus, Lynsey le Grice (Befrienders). Welcome: Margaret Copland introduced the platform party and thanked everyone for coming. She then gave the reasons for the meeting. Monifieth Local History Society was formed in 2000 by people with a similar interest in preserving the heritage of Monifieth, their `home town`. They became a constituted registered non profit making charity. With the number of items loaned and donated by those who wished them to be displayed “ in Monifieth where they belong” the House of Memories, a community project undertaken by volunteers, members of MLHS, soon developed into what has become not only a link to the past, providing the services of a heritage information centre, it has grown into a tourist attraction. The leased premises are no longer appropriate or suitable for purpose, and the planned improvements, require relocation to accommodation with proper display area , disabled access & facilities. Areas available for research etc. Application for a Community Asset Transfer lease has been made by the group, to Angus Council for the vacant former Access Office which would meet all the necessary requirements of A Monifieth Community Heritage Centre. This would however require the support of the hundreds who pledged their support for such a “benefit for all” to consider becoming Members or giving time as volunteers, should the Lease be granted. Together with MLHS at the table, and a good Management Committee it can be done. She then asked Norman Atkinson to address the meeting. Norman Atkinson: spoke on: ‘Preserving our heritage for the future’. All other burghs, apart from Monifieth and Carnoustie have museums. Heritage is for the future – away beyond any of us here. Heritage is not just a hobby, but good for tourism and Family History is now big business. Most heritage centres/museums start off as voluntary organisations. Heritage gives civic pride to both the professionals and volunteers concerned. Request for Members and Volunteers: Marianna Buultjens drew attention to the membership and volunteer forms which had been handed out. Members are necessary to provide finance for the Society to help it continue its work and if there is to be a new Heritage Centre, volunteers with a range of skills are vital. Open to the floor: questions and answers chaired by Norman Atkinson: Questions and topics raised by members of the public and councillors were: Heritage Trail/Pictish Trail; Disappointment at lack of young people at the meeting; Topics which could be addressed in the Access Office building if Lease application successful, for example: Reminiscing therapy; history research and related design and artistic skills; organising visits from schools (Friday afternoon was mentioned as being good for senior pupils who could use this experience on their CVs for university application.) Date for renewing of getting membership of MLHS (1st June 2018). Many of these and the other practical suggestions, have been carried out over the years in the House of Memories. Angus Council Representatives: Rhonda McFarlane and Sylvia Breen talked about ‘Asset Transfer’ which MLHS has applied for and is at the Representation Period stage where members of the public can comment, until 7th We should hear if application is successful by November. Funding sources for equipment were mentioned. Margaret Copland thanked the meeting for the constructive ideas and said that should the lease of the building be offered to MLHS she hoped we would have volunteers! Please come along and support this event. Come as a team or individually. It promises to be a very interesting and enjoyable evening. The Crown is on the High Street almost next to the House of Memories. Welcome and Thank you all for accepting the Monifieth Local History Society invitation to attend the meeting tonight. We have in attendance Norman Atkinson. OBE, Chairman of Angus Museums and Heritage Forum, who will talk on “The importance of Heritage”. Office bearers of MLHS Also representatives from Angus Council , who support our proposed plans for Monifieth`s House of Memories future development, and will perhaps deal with some of the questions you would like answered. For those of you who do not already know, I am Margaret Copland, President of Monifieth Local History Society, and spokesperson on their behalf. In 2002 we were finding difficulty in locating premises to meet, give talks, and display some of our work. Something that sixteen years later has become even more of an extreme problem , with the closure of halls, hotels, demolition of buildings formerly used by groups and organisations to meet or socialise. In 2003 after lengthy negotiations MLHS leased the former retail premises at 55 High Street. 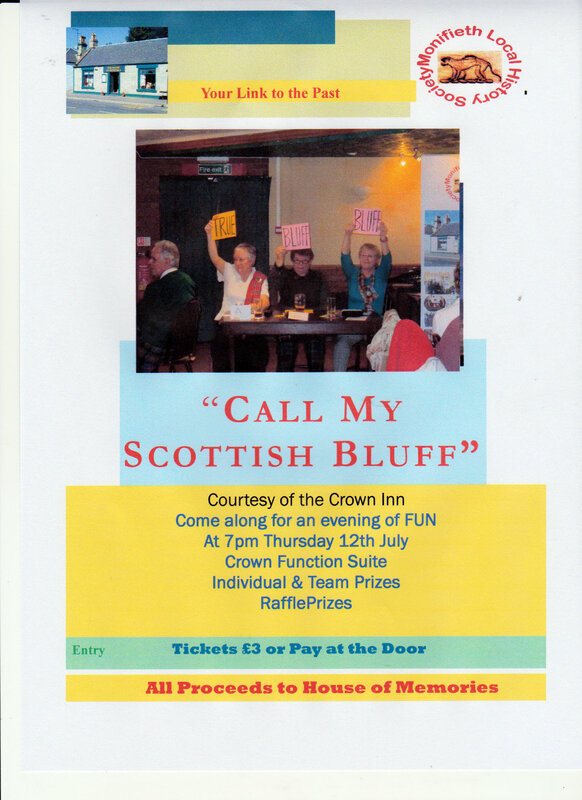 The building was in a sorry state of disrepair, that`s probably an understatement, but the MLHS members with a great amount of support and help from members of the community, businesses, and some financial funding from Awards for All and Angus Council, in April 2004 , opened what was to become Monifieth House of Memories, free of charge to the public at large. The community project is managed and financed by unpaid volunteers, who are also members of MLHS. Over the years the services provided by the group has steadily grown, and improved. A bit like Topsy. Our website is very active, an information source viewed by people throughout the World. It creates an interest in Monifieth, with local, national and international visitors , making the House of Memories a recognised tourist attraction. What do they find at 55 High Street. We have faithfully honoured this request, but time is against our willingness and ability, we are getting older, membership numbers and committed volunteers dwindling. The premises are no longer, fit for purpose, and due to pressure of work providing services similar to a Heritage Centre, we do not have time to organise and run fund raising events. To keep the doors open we have to find £9000 per annum. With this in mind, following months of discussion and negotiations with representatives of Angus Council, in February 2018 made formal application, as is their legal right to do so, for a Community Asset Transfer Lease of the former Angus Council Access Office. The building is appropriate for the needs of a Heritage Centre, with all the necessary facilities, a large open display area, toilets, access and parking for the disabled. There is also the added bonus of several rooms, which could be used for research, small group meetings, at the discretion of the Management Committee. Our application has been accepted and is currently being considered before being presented to the Angus Council for their approval or disapproval. Here comes the `nippy bit`. It is not part of MLHS `s constituted objective to manage and finance a Heritage Centre and should we be offered the short term lease of 3/5 years for which we have made application, before accepting and signing such a binding contract we need the assurances from the Community that they will support the planned project in every way possible. Together we can do it for the future benefit of all generations. MLHS need more members of all ages and committed volunteers to make this dream reality. The history of Monifieth reveals that the “Glory Days” were when Monifieth services etc, were managed by the Burgh Council formed by unpaid volunteers, with no political or religious aspirations, only the desire to get the best for the Monifieth residents. Sad to say that is not what is happening today, political and geographical boundaries, and financial greed are strangling what was a vibrant community. Monifieth residents are sleep walking, and will waken up in a dormitory location with no way back. 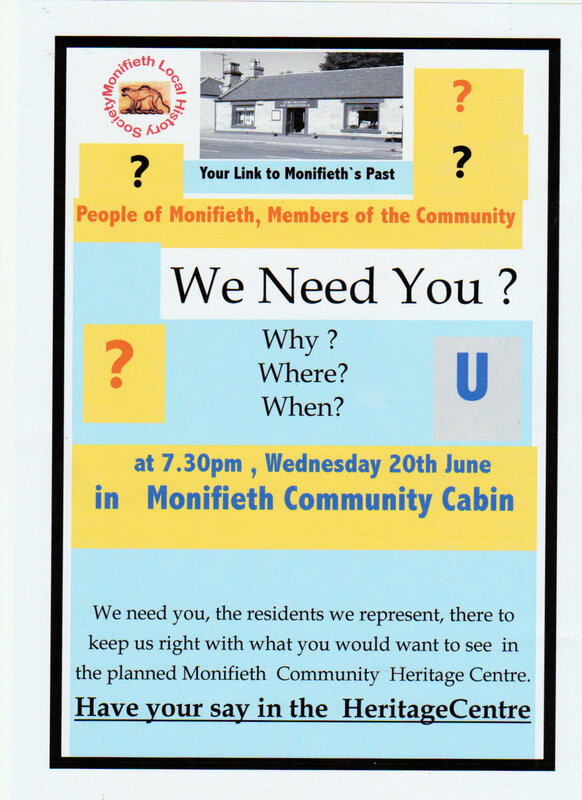 We have an opportunity to start turn this situation around, and together change the reputation of “Monifieth has Nothing to Monifieth has a Community Heritage Centre”. We chose Monifieth as our home then let us once again make it a town to be proud of what it has to offer. We have for some considerable time, been negotiating with Angus Council representatives regarding the future of the Monifieth House of Memories, our community project. It had become apparent due to the success of this venture over fourteen years, that larger and more appropriate premises were the only answer to the survival of Monifieth`s Link to the Past,.a considered tourist attraction. Our application for an Angus Community Asset Lease is under consideration by Angus Council for relocation to the former Angus Council Access / Police Office..
To establish a Monifieth Community Heritage Centre would be a big step forward bringing future benefits to all age groups and interests in Monifieth. The word COMMUNITY is of key importance to achievement. We hope to see you or your representatives, and hear what you have to say. Monifieth Community Working Together can make it happen. The month of May has been an exciting and busy one for our group, although it must be said the due to the lack of committed volunteers, we have been unable to keep the doors of 55 High Street open free of charge to visitors, as we would like. Certainly the change in the weather has brought many visitors, to view our items on display. One morning in particular I was trying to cope with about ten visitors, including some from overseas. The local people who were accustomed to just ‘popping in’ are finding it difficult to navigate the crossings, necessary to by-pass the area of pavement closed off due to the building work in progress, on the site of the former South Church Halls. We must look forward to the holiday visitors, particularly those regulars from the Caravan sites, who support our work. Today the 1st June is as you know when annual membership fees are due to be paid. Hopefully with the publicity given to our plans for the future, to work with others to establish a Monifieth Community Heritage Centre, for the benefit of all. will swell our dwindling membership numbers, mainly caused by the unstoppable ageing process. It is astonishing the numbers who have offered their support and help to our group, with many making generous cash donations, There are already website followers grateful for the services and information we provide, enquiring about becoming on line members, in order to show their gratitude. We appreciate this gesture, as relocation of all the items, of which we volunteers of MLHS, are custodians, becomes a reality, then committed manpower and finance will be essential to make the move towards the future information source of Monifieth’s Past. In September it will be eighteen years since, with the assistance given by Angus Council Community Education Department, the Monifieth Local History Society was formed. We have come a long way since then and developed talents through necessity, friendships, and a reputation for providing many varied services, locally, nationally, and internationally. It would be rewarding to hear, as an acknowledgement and recognition of our work, the President’s report at the management meeting for September, read in the Monifieth Community Heritage Centre. Monifieth resident’s have always had wishes for the future; let us hope that this one will come true. Thank you all as volunteers for your commitment to our objectives, through giving so much of your time, and varied talents, over the years to successfully bring us this far.